Sister Louise Margaret loved to draw and paint. Not only did she leave us compositions of scenery, animals, flowers and still lifes, but what made her famous is her picture of Jesus the Merciful. According to the testimony of Sister Margaret Reynaud, co-foundress of Bethany of the Sacred Heart, the picture was painted at the orders of Sister Louise Margaret‘s spiritual director, Fr. A. Charrier, after Sister Louise had told him that she had seen Him in a vision. By a strange coincidence, Mrs. Chamberet also asked her daughter to paint a picture of the Sacred Heart as a remembrance, because she was certain by then that all the Sisters in Romans would be going into exile. Yes, Mrs. Chamberet even provided the gilded wood panel and everything else necessary for the painting. Contemplating the picture brings to mind two attitudes of Christ; sweetness and majesty, both closely linked with one another. In addition, Jesus is pointing to his pierced side. The rent in the tunic, then, is almost in the form of a heart. Thus Jesus manifests Himself as the fulfillment of the prophecy of Zechariah, “They shall look on him whom they have pierced” (Jn 19:37 NAB). 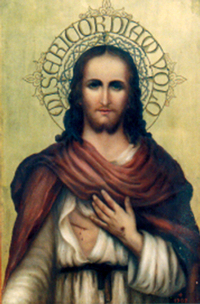 It is the wound in His side that reveals the Infinite Love of the Heart of Christ and becomes the fount of Mercy. “O my sweet Mercy, O Jesus, who died of love on the cross, grant us that being brought back to Thee by the attraction of Thy Mercy, we may live by Thy love and for Thy love” (Intimate Notes: Good Friday, 13-4-1900). There is still one more significant detail: the picture recalls the majesty of the “eternal high priest,” the “divine sacrificer,” who, from His open side, continues to pour out over humanity and, in particular, over His priests the “life-giving waves of Infinite Love.” The spear wound is on the right side, so the reference to the vision of the prophet Ezekiel (Chap. 47) is evident. Jesus is both “priest” (Hb 4:14) and “temple” (Jn 2:21): the water that brings salvation pours out below the right side of the temple; it comes forth in such abundance that it turns “into a river,” which gives birth to abundant life wherever it flows. In this light the wound in Jesus‘ side appears also as the “door” (Jn 10:7) to enter the temple and find “mercy and favor” (Hb 4:16). A magnificent commentary on this picture is the page written by Sister Louise Margaret as she meditated on the Parable of the Prodigal Son, which is an exaltation of the merciful Love of God that shows itself in the person of Christ: “I meditated on the Prodigal Son. Oh! What a sweet and consoling meditation! This parable is an exquisite portrait, traced by the hand of Jesus Himself, of the Infinite Mercy of the Heart of God. How good He is to trace in detail all its lineaments and to show all its divine beauties.